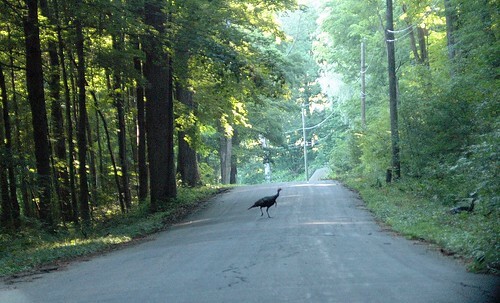 turkey crossing, originally uploaded by jahansell. Turkeys are notoriously difficult to photograph (I almost wrote "difficult to shoot" which is also true!) - they trot away from humans quickly. There was a whole family hanging out on this road, but in the short amount of time it took me to pick up the camera from the seat and aim it, the rest had melted into the bushes. This one had gotten separated from the rest of the flock, so as it tried to rejoin its family I was able to get a quick pic.